Groundhog Day was months ago, and across the country, Canadians are only now daring to emerge cautiously from our holes in the ground, wondering if the strangest winter in recent memory is finally over. Take, for example, Victoria. Looking back, thanks to the miracle of social media, Victoria’s cherry trees were in full bloom in mid-February last year (yes, we know that makes you hate us; that’s one of the reasons we post those photos every year). This year, Victoria had blizzards through February. Blizzards. Of actual snow! That’s a once-a-decade or so occurrence. But weather be damned, it’s spring on the calendar, and in the bookstores. Our hardy crew of independent booksellers has recommendations for every eventuality, from guides to take you outside (down to the dirt or up to the skies) to companions to warm you indoors. Plus, a baseball book, because it IS spring, after all. And summer is just around the corner. Though many of us will believe it when we see it. With Baseball Life Advice, Stacey May Fowles has captured the tumult, frustration, and unabashed love that comes with being a long-suffering Blue Jays fan. With spring finally here it’s time to get back out to the garden, and there is no better place to prepare yourself for island gardening than with Linda Gilkes' Backyard Bounty. 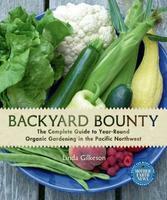 A complete guide to year-round organic gardening in the Pacific Northwest, Backyard Bounty offers spot-on and down-to-earth advice to gardeners. With an emphasis on low-maintenance methods for high-yield crops, Backyard Bounty is certain to become a book you return to year after year. These two different perspectives, separated by 40,000 years, begin to reveal the similarities in Girl and Rosamund's lives, from each woman's need for survival to the primal forces of childbirth. Cameron's latest involved five years of intensive study of Neanderthal history, including an exploration of her own DNA (she's 2.5% Neanderthal), and it is a powerful exploration of the not-so-changing roles of women as well as our own human history. Once in a while we all need a reminder that love exists. To find it between the pages of a non-fiction title - between the pages of a novel stemmed out of heartbreak—is too perfect for words. Juliet's Answer reveals more than just science and Shakespeare, it reveals how important and powerful love can be ... with a little help from Juliet. If you want to become, or already are, a serious birder, this regional guide will take your birding to the next level. Detailed but user-friendly, Birds of British Columbia and the Pacific Northwest includes hundreds of full color photos and range maps, as well as bird diagrams and a glossary of technical terms.